Not far from where Marpa lived there was some open land in the middle of a village. The local people had all agreed that no one would own this land and it would be held in common. They had all signed a paper to this effect, except for Marpa, because he wanted to build a house there for his son. But he had to be clever about it. If he just went there and built it, the villagers would protest, so he had Milarepa first build a round house in the eastern direction. When Milarepa had half finished it, Marpa said: I don't think this turned out very well. He told Milarepa to tear it down, return all the stones to the place where he had taken them, and all the earth back to the holes where he had dug it. So Milarepa returned all the stones to their place, all the earth to where it belonged, and then went back to Marpa: I have followed all your commands, now please teach me the Dharma. Marpa replied It is not quite time yet. On the peak to the south, I want you to build a house in the shape of a half circle. Once you have finished building it, I will teach you the Dharma. Milarepa again went out and started collecting stones and earth and began to build up the walls of this second house. When he had progressed considerably, Marpa came to see him: Who told you to build this house? Milarepa said, You did.. Marpa replied I must have been drunk or crazy. I don't remember anything about telling you to build this house. So Milarepa again had to take down the house and return all the stones and all the earth back to their places. Having completed the task, Milarepa went back to Marpa and said, I have finished all the work you told me to do. Please grant me the teachings of Dharma. Marpa said to him Now in the future you shouldn't be doing work that you weren't told to do. Actually what really needs to be built is a triangular-shaped building, which should be put on a peak in the western direction. If you finish this house, I will teach you the Dharma, and not only that, I will celebrate it with a great feast. This time Milarepa was a little anxious about the directive: Precious lama, the first time you said you hadn't thought it through very well, it wasn't what you really wanted, and the next time you said you really didn't remember having told me to build that house. Now again you are telling me to build a triangular-shaped house. Would you mind if I brought in your wife as a witness to this? Marpa agreed that his wife Dagmema could be the witness. Dagmema said: Maybe this is work my husband doesn't really need. I am not really sure what the reason is behind all this work he has given you, but if it is done for the sake of the Dharma, then it is good work so I will be a witness. They wrote a letter that said once these walls were built, they would not be torn down and that Milarepa would receive Dharma teachings. Again, Milarepa went to gather together earth and rocks to make a house, and slowly the walls of the house were built up. It was such heavy work however, that large sores began to appear on his back. Since he could no longer carry things on his back, he carried them on his hip, but then sores also developed there, and so he carried things on his chest and sores developed there. He was surrounded by sores, and not only that, the water and earth he was carrying to make mortar entered into them and it was very painful for him. Yet he thought, Well, this is the command of my lama and continued his work with diligence and energy. Though he was in such pain Milarepa reflected: I can't really show these sores or speak of these problems to Marpa because he is a very high lama and also he would probably get angry with me. His wife is full of compassion and kindness but if I show them to her, she would probably think I am proud of all the work I've done. With no place to turn, he was filled with despair and weeping in the house. Dagmema came and asked him why he was crying, but Milarepa did not reply. She lifted up his chin and said: Don't cry; you will get the Dharma teaching. Milarepa finally told her his real feelings: You are kind to me as a mother. And in order to obtain the precious Dharma, I must build this house. Yet in building this house my body is becoming nothing but a huge wound. Until now I have worked as hard as I can carrying stones and earth, but it is extremely painful. Dagmema now looked at Milarepa's body which had been covered before, and seeing all his festering, open sores, she cried: You are right. I've never seen such wounds on a human being before. Your situation is even worse than an animal's. A horse only gets saddle sores on its back, but you have them all over your body. I don't understand why Marpa is making you go through all of this. But stay here and I will take care of you. I will go to Marpa on your behalf and try to see if I can't arrange for you to receive the Dharma. Dagmema went to Marpa and described to him what Milarepa was going through, and Marpa also cried, Such diligence and great effort made for the sake of Dharma and to fulfill the commands of the lama makes me very happy. 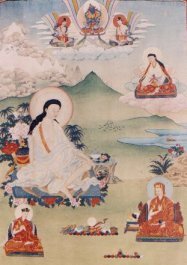 Marpa agreed that until Milarepa's wounds were healed, he could stay; Dagmema could give him good food and bring him back to health. She took good care of him and Milarepa was happy. His mind, however, was not satisfied; he had not yet received the Dharma. One day Marpa was giving the initiation of Chakrasamvara (Demchok). Many of his students had come and brought wonderful offerings. Milarepa also went and happily joined the crowd. But Marpa looked at him and said, What do you have to offer? Milarepa replied, Well, I've been building this house and that's my offering. Marpa admonished him: You're building this house but it's not finished. It's a finished house that you must offer. And he chased Milarepa away, but Milarepa did not leave immediately even though he'd been told to. He made his request again: Please, let me stay and receive this initiation. Marpa came up to him, cuffed him across the face and tossed him outside. Milarepa went sobbing to Dagmema, who comforted him, Don't worry. Slowly, with time, you will receive the Dharma. Sometime after this initiation, Marpa came to Milarepa. We had a little bit of a set-to the other day. Has your mind not turned against me for this? Milarepa replied, I have committed monstrous negative actions. They are the cause of the bad things that happen to me. My faith in the lama has not changed, not at all. Marpa said, That's true. I went through great difficulties in order to bring the Dharma back from India. So now, you go back and finish building the walls. One day, Marpa came to Milarepa, who was in the process of building the triangular-shaped house. Great Magician, who told you to build this house? Lama, you were the one who told me to build this house. Marpa retorted, This is a triangular-shaped house. Triangular-shaped houses are for evil magicians who use mantra in their practices. What are you doing? Planning on staying here and performing black magic on me? Are you going to kill me? Marpa commanded that he tear down this magician's palace and replace the stones where they came from and carry the earth back to its place. Once more Milarepa returned and reported to Marpa that he had fulfilled his command. Marpa replied, "Well, what do you need then?" "I need the Dharma. Please give me the Dharma," begged Milarepa. Marpa finally agreed and told Dagmema to make a very good meal and give it to Milarepa. Then Marpa gave him refuge vows and advice. He also gave him the short spiritual biography of Naropa that describes the twelve difficulties he had to go through. Marpa said to Milarepa, I have given you now what is called the common or general Dharma. As I said, if you want the uncommon or exceptional Dharma, you must have the capacity to go through extreme difficulties to demonstrate faith in the lama and to maintain stable, unchanging samaya. Is this something you can do? The fourth house that Milarepa was asked to buildt was to become the famous nine-storied tower called Se Kar Gu Tok, "the house with nine stories for the son." Marpa had drawn the plan for it on the ground, and Milarepa had started the construction. As the tower was located on the land of the village where no one was supposed to build, the people became concerned: What's going to happen with this house that's going up on our land? Some thought, Well, maybe Marpa won't really build it. He's started all these other houses and they've come down. Other people said: Well, I think he's just crazy. He's having all these houses put up by this student who's real strong. Three-cornered houses and four-cornered houses, and they're just going up and down and this one is going to come down, too, just like the rest of them. And then they said, If he doesn't destroy this house, then we'll gather together and fight him. We'll bring it down ourselves. The nine-story tower was built all the way up to the top. Milarepa built all himself, with not even one stone being carried by another person. He went through untold physical hardship, as related in his full biography, now published in English. By the end, the only thing missing was the roof. At last when the villagers realized that this one was not going to be destroyed, they got together and decided to attack it. Realizing what was happening, Marpa created an illusory army that circled the tower in all directions preventing anyone from coming close. The villagers were astounded. Where did all these soldiers come from to protect Marpa? Seeing they were up against a force beyond their strength, they went to Marpa, apologized, and promised that they would not destroy this tower. During the long and difficult period of the tower construction, no matter what Milarepa did, Marpa would never give him the teachings. Milarepa finally despaired: It looks as if I'm not going to get Dharma teachings from Marpa. I'll have to go to another lama. He went to Dagmema, and explained his thoughts to her. She consoled him, Well, it's all right. You're not to blame for this. The lama's very difficult, and he's given you a tough time. Keep working on the house, and I will work something out so that you can receive Dharma teachings. One day, Dagmema wrote a letter making it seem as if it came from Marpa, and sent it to one of his main disciples, Lama Nyokpa. It read, "I'm extremely busy. There's much to do, too many students, and I can't give teaching to this Great Magician. Please, give him some Dharma teachings." There was a festival coming up, a grand ritual celebration, and Dagmema had made some beer, actually very strong beer, which she gave to Marpa during the ceremonies. He got quite drunk and she was able to take his seal and stamp the letter. In Tibet, letters are not signed, but stamped with a personal seal, which is guarded carefully. Then Dagmema borrowed, so to speak, a ruby mala that had belonged to Naropa and also bone ornaments that had belonged to him. She sent these along with the letter as a sign that this was the real thing. Giving the letter, the ruby mala, and the bones to Milarepa, Dagmema said: Here, take these blessed objects and this letter, but don't say I'm the one who gave them to you. Pretend they are from Marpa and that you are one of his disciples. Take these to Lama Ngokpa. I will say prayers for you. Practice diligently. Don't have any wrong views about Marpa. I have great hope that you will indeed receive teachings from him eventually. She gave him tea, butter, and something like Tibetan cheesecake and sent him on his way. When Milarepa left, he was of two minds. On the one hand, he was very happy because he was finally going to receive the Dharma, and on the other he was sad for he had to separate from Dagmema, who had been so kind to him. He shed tears and asked her, "Please do not forget me. Keep me in your prayers. Make prayers that we will meet again, and I will do the same." And so he parted from her. As Milarepa went along his way, he asked where Lama Ngokpa's house was and finally found it. As he approached, Lama Ngokpa was sitting on a high throne teaching hundreds of students. When Milarepa came to him, he was reciting these lines: I am the one who explains, I am the Dharma that is explained, and I am those who have gathered to hear the teachings. I am the guide of the world and the one who creates the world. I am of the world and beyond it. I am the true nature of spontaneous bliss. In Tibetan tradition, the point at which teachings are interrupted by such an event are considered very significant. Milarepa bowed to Lama Ngokpa from a distance. The lama stood up on his high throne, took off his hat, and bowed in response to Milarepa's prostrations. The students were surprised and asked their lama, Who is this that you're treating with such respect? Lama Ngokpa replied, Ask him who he is. His way of prostrating is like that of Marpa, so I assumed he was his disciple and bowed to him. One of the students approached and questioned Milarepa who responded as Dagmema had told him--he lied. He said that he was a student of Marpa's, that he had come to take Dharma teachings from Lama Ngokpa, that Marpa had sent him, and that he had brought a ruby mala and bone ornaments from Naropa as confirmation. When Lama Ngokpa heard this from his students, he was extremely happy. Wonderful! Tell him not to come right away, but to wait. The students brought Milarepa some beer to drink, and said that they were going to form a great procession for him in the traditional style with victory banners, music, and the monks wearing all their fine robes. Milarepa was asked to wait until they could receive him properly. He was exuberant. With all the brilliant ceremony he thought had arrived in the land of the gods and now at least he was going to receive the teaching. He reflected this was all due to the kindness of Dagmema and shed tears remembering her. Lama Ngokpa gave Milarepa teachings and also taught him how to practice. Milarepa meditated for quite a while, but nothing happened--nothing at all. There were no signs of realization, no experiences, nothing. Lama Ngokpa was astounded: With these teachings, there's no way that nothing can happen. What's going on? He began to have some doubts, so he questioned Milarepa more closely, and finally Milarepa told the truth: Well, actually, that letter wasn't from Marpa and neither was the mala or the bone ornaments. Lama Ngokpa replied, Well, that must be the truth, because without the lama's blessing, experience and realization cannot arise. About this time a letter arrived for Lama Ngokpa from Marpa. It read: "The house is finally finished and I'm going to have a big celebration in honor of this occasion. Please come with your students and bring whatever you have to offer. As for that lousy student of mine, you can bring him along, too." Except for one goat with a bad leg, which he thought wasn't good enough to offer and thus left at home, Lama Ngokpa took everything he had gathered throughout his life as an offering to Marpa. As they approached Marpa's house, Lama Ngokpa felt a little tired, it having been a long journey, and so he said to Milarepa: You go on ahead, and from the house bring me out some beer to drink. Before we get there, I'd like to just rest a little bit. Milarepa went to the house and met Dagmema, who was delighted to see him. He delivered Lama Ngokpa's message and Dagmema said, Fine, but first we should go and greet Marpa. Milarepa explained to Marpa that Lama Ngokpa had come, that he was a little tired from the journey and that he would like some beer. Marpa became furious: What! I went to India at the risk of my life to get this Dharma teaching from Naropa. No one was there to greet me with beer. What's this person talking about? If he wants beer, he can come to the house. Once again Dagmema demonstrated kindness, and sent beer out to them. Soon, the party arrived at Marpa's house. Lama Ngokpa then said to Marpa, I give you power over my body, speech, and mind, and all the wealth that I have. Whatever I possess, I offer to you. The only thing I haven't offered you is one goat with a bad leg. I ask you to give me the special instructions of the Dakinis. Marpa replied, All the other Dharma I know I have given you, but if you want to receive this secret instruction of the Dakinis, you'll have to bring me that goat. Lama Ngokpa himself went back to his house and fetched the goat. It took him one day to return to his house, and then he walked the whole night back with the goat on his shoulders and offered it to Marpa.